If you answered yes to any or all of these questions, you are ready to plunge into the wonderful world of Etsy Jewelry Selling ! There are a several very easy steps to begin selling jewelry on Etsy. You need to sign up! This is the easiest part. Go to Etsy.com and click on "register". You will need to choose a username and password. This user name will become your shop’s web address so CHOOSE WISELY! 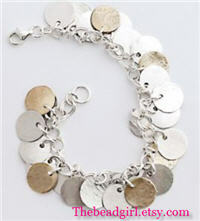 Once you have filled out the initial sign-up page you will need to wait for a confirmation email from Etsy. When it arrives, click through the link in the email and you will be confirmed on Etsy. They will ask you to log in with your username and password. You didn’t forget it already did you? Once you are logged in, click on the word SELL at the top of the home page. This is where Etsy will guide you through the steps to get your shop started. Their directions are so clear, I’m going to leave you to read through and follow the steps. This will include entering address information, billing information as well as a credit card number. Don’t worry, no charges, just important to validate you are indeed a real human being. Read on when you are all set to sell your jewelry! There are several items you should have ready before you even list your first item. Click on the link in the left margin SHOP SETUP to make your shop yours all yours. Don’t be scared, you’re a creative person remember? This is the fun part! SHOP TITLE: This is the easy one! BANNER: This can be a simple jpeg file with your shop name, or something deluxe. Your banner is what appears at the top of your shop. Consider it your Marquis, or sign. Etsy is so incredibly user friendly they even have a place to give you a head start in banner making. You can choose from several styles they have available here http://team.etsy.com/bannerdisplay.php or you can do a search for “banner design” and find a fellow etsyian to design one for you! SHOP ANNOUNCEMENT: This is your mini bio about your shop. It needs to be catchy, short, descriptive and to the point. If it is too long, they can’t even see your listed items. So write something simple, you can always edit later. ALCHEMY: That’s for another post! Leave the DO NOT ALLOW checked for now. MESSAGE TO BUYERS: This is a mini thank you note your buyer will receive as an email after they complete a purchase in your shop. Again, simple and sweet! Here again Etsy is fabulous at walking you through the steps necessary. Just read! You can read can’t you? This is not important right away, however, if you sell jewelry like myself you may want to divide your items into sections like rings, bracelets, and necklaces. I know you are feeling discouraged by all the info, but don’t be! None of this is too difficult, and you have me to guide you, so hang in there! Primary Shipping Cost: how much will it cost you to ship ONE of your items. Don’t be greedy…be accurate. Weigh your item, go to the USPS website and calculate postage. Figure in the cost of your box, or envelope or whatever packing materials are needed and type in that amount. Take photos of your items. One of the great things about Etsy is that you can have up to 4 photos of your items for the single listing price of $.20. What a bargain! 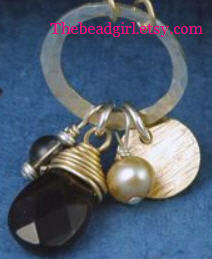 Remember that images are the primary way that your Etsy jewelry shop customers experience your wares. They can't touch, feel or try them on, so use all 4 of the image spots, and treat them as the "prime real estate" they are. Show your product at different angles, give close ups, etc. Do make sure you take clear photos. Don’t worry so much about props and backgrounds, you are not a catalog, you are selling YOUR designs not a prop! So make sure they are an excellent representation of your design. Now it’s time to LIST your first item. Are you ready? This is it, you are taking the plunge and I am so proud of you! Click on YOUR ETSY in the top toolbar. On the left side of the page you will see a listing of different options. Click on ADD A NEW ITEM. The first thing Etsy will want you to do is set up a payment profile. How do you want to be paid for your item when it sells? AND IT WILL!! I highly recommend PayPal, it’s safe, reliable and EASY! TITLE – this is one of the ways your item will be found, if you are listing a ring use the word ring, if it’s a band use the word band. SORT YOUR ITEM – Again Etsy does a fabulous job of describing how to do this. Read, read, read. Then do, do, do. Don’t worry…you CAN change it later! IMAGES – Upload your images one at a time. The first image you upload will be the thumbnail shown for your listing. FINISH – This is where you proofread everything and make your final check. If you want to change anything, click on the pencil next to the part you want to change and it will take you back to that section. YOU’RE DONE! YOU DID IT! You are now an Etsy jewelry shop owner with products for sale and everything! I am so proud of you! There are so many more facets to Etsy, but now that you have the basics, you can get your items listed and then take it step by step. You will never have access to a more helpful community of people than at Etsy. Please don’t get frustrated when you don’t sell right away, people need to find you and that will be based on your tags & descriptions, as well as your involvement in the community. I myself have only begun to scratch the surface! If you have any questions, please feel free to email me at [email protected], or visit my Etsy shop! I would LOVE to help in any way I can!